History of libraries in the area, from the Thornbury Mechanics' Institute to the Leonard E. Shore Memorial Library. A history of the Leonard E. Shore Memorial Library in Thornbury. 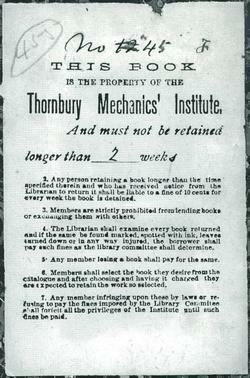 Bookplate inserted into Thornbury Mechanics' Institute books outlining the rules around borrowing books from the Institute. Mechanics institutes were educational establishments usually funded by membership fees and by local business. The Thornbury Mechanics' Institute was in operation in 1890s and possibly earlier. The Leonard E. Shore Memorial Library, home of the Blue Mountains Public Library, was constructed in 1995. 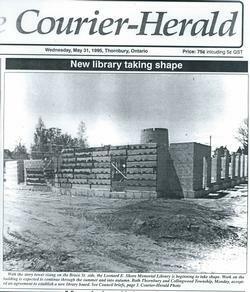 This photograph of the construction appeared on the front page of the Thornbury Courier-Herald. It was taken from the corner of Bruce and Napier Street shows the story tower (silo) and the wall with many openings (windows) along Napier Street. Those openings became window seats for people to sit in and read.